Make Your Own Beautiful Cloth Napkins. One of the crafts that I love to do is make my own cloth napkins. A good time to buy Christmas material is right after Christmas. You can get the material very cheap and make your own napkins for the next season. You can make some for Thanksgiving, Fourth of July, Valentines or any other holiday. If you have a baby shower coming up or a bridal shower you can find some really pretty material that will fit the occasion. They are great for anniversarys and then the happy couple can take them home and have a visual memory of that special day. You can make some beautiful holiday napkins and they are so much better than paper napkins. If you watch your local fabric shop they have sales on all the time and you can get some beautiful material to match any setting you want. You can go for elegance or just plain fun napkins. I make cloth napkins for all the holidays and for any occasion. They don’t have to be costly and they last for a long time. Just wash them and they are ready to go again. You will need to look for a fabric that will compliment your tablecloth, placemats or dishes. Often times a piece of fabric can be found for as little as a dollar or two a yard and that is perfect. It needs to be cotton as this is what is going to work the best. 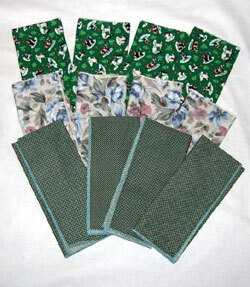 The picture below is just some of the napkins that I have made. They have been washed many times and still look good. You will need approximately one yard for each four napkins you are going to make. If the piece of fabric measures 36" X 36" you will be able to cut four 18" squares. Cut your fabric into 18” squares. You can make a template out of a piece of cardboard and then use a rotary cutter. If you have a serger just serge around the edges. If you don’t have a serger then use your sewing machine. I have found the easiest way is to sew ¼” from the edge. Now press the material on your sewing. Be sure to bring the sewing to the inside so that it won’t show when you are done. After you have pressed the ¼” then turn another ¼” and you have now hidden your raw edge. Press this and then sew them all the way around the edge. You have now made a napkin. You can get real fancy by using different stitches on your sewing machine. You could also think about decorating your cloth napkins. 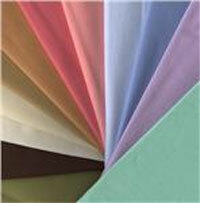 Buy some light colored cloth and either paint a design on them or embroider a design or your initials. Your initials give you a truly elegant touch. Just experiment with the design and have fun.